Our Tanzania Adventure is a great value safari, visiting amazing, game-rich areas of Tanzania, this scheduled departure features classic-level accommodations that keep this an economical solution without sacrificing quality. Book the Tanzania Adventure at the Classic accommodation level and celebrate with a 50% companion discount for the second traveler. Book by June 30, 2019 for travel by October 31, 2019. The adventure begins! Fly to Africa. Welcome to Africa! Unwind at your hotel for your first relaxing night. Your first day of safari you head out towards Lake Manyara National Park. As you travel through beautiful grassland and rolling hills, you may see the Masai herding their cattle and goats. 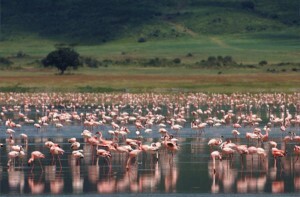 In Lake Manyara National Park, the park is a bird watcher’s paradise. Expect to see a variety of animals such as impala, elephant, dikdik, bush buck, hippo and if you’re lucky see the famous tree-climbing lions of Manyara. Start with a game drive and then head up the amazing Rift Valley escarpment with beautiful views of Lake Manyara. Then on to the Ngorongoro Conservation Area – gate way to the Serengeti. Visit the archaeological site of Olduvai Gorge, famous for the Laetoli hominid footprints and many other archaeological discoveries. Two days of glorious game drives in the land of endless plains. Morning and afternoon game drives in Serengeti National Park. All meals are served at the lodge, however; at the driver/guides’ discretion, a picnic lunch may be taken to maximize game viewing. A range of different habitats provides many different animals. Look for lion, leopard, cheetah, hyena, elephant, hippo, impala, zebra, wildebeest, grants gazelle, Thomson’s gazelle and many others. Also there is a large variety of bird life. The sheer size of this park and its amazing changing scenery make this a day to remember. After breakfast you depart for Ngorongoro, viewing game as you transfer across the vast Serengeti plains. After a picnic lunch you continue to your lodge, set high on the rim of Ngorongoro Crater. You will have time to freshen up before enjoying a delicious dinner, followed by a well-deserved night’s rest. Departing Ngorongoro Crater after breakfast you continue to Tarangire National Park. You drive through the highlands and the Karatu district, viewing the scenic wheat plains and coffee plantations here before journeying down the spectacular escarpment where you turn south onto the main Arusha – Dodoma Road and into the park. From here to the lodge, you’ll enjoy a game drive en route to your lodge. After lunch and perhaps a swim, the remainder of the afternoon will be spent on a game drive. Dinner at the lodge. Depart after breakfast and head north east to Arusha. You then transfer on to Kilimanjaro to commence your departure flight. Arrive home with memories to last a lifetime! Tanzania Adventure – Scheduled weekly safaris starting with arrival into Tanzania on Tuesdays and Thursdays. Features all of the popular northern Tanzania game parks. Travels in custom designed 4×4 safari vehicles with driver/guide and open roofs for game viewing. This is a small group seat-in-vehicle safari with a maximum of 7 travelers, all with window seats. Safari includes meals, accommodation, park entry fees with visits to Serengeti, Ngorongoro, Lake Manyara and Tarangire. We descended the highlands and then drove west into the famous Serengeti. I had dreamed about this wildlife heaven for most of my life and could hardly believe that I was truly here! Our guide was incredible and let us travel at our own pace; we often wanted to just sit quietly in the vehicle and listen to the sounds of the Serengeti savanna.